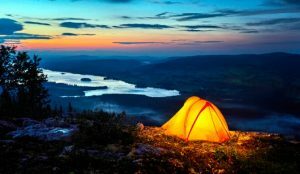 If your first mountain camping trip is going to be with a seasoned mountaineer, then you are already on the right track. But if you are going by yourself or a bunch of novices, then make sure you do all your research first before setting out on this type of adventure. Always make it a rule no matter how big the mountain is, to try and set up on the leeward side of the slope. This will give you much better protection from the elements. You can go without a lot of food, but when you are at high altitudes, you need to make sure that you stay hydrated. This is where your water supply is going to be important. Also, especially if you are being quite active, you will need to keep your electrolytes up. This means you need potassium, and you can get a good supply of this from bananas. Two common complaints that mountain campers have, is they often get muscle cramps and suffer from headaches. The water and bananas can help ward this off. You are going to want to travel light as you will be moving to different elevations as you explore the mountains. There are some extras that you should carry with you, namely stakes and rope for holding down your tent. Tie downs probably came with your tent, but with the excess winds that can occur in the mountains, this may not be enough. One item that many that are new to mountain camping tend to forget, is the sunscreen. Sunlight and intensity seems to be much stronger in the mountains, and believe it or not, you could end up with a sunburn, no matter what time of year. Another issue you may have to deal with is dry skin and lips. So make sure you take along a product that will help.